Europe has gone through great upheavals in its religious profile in the course of the twentieth century and the process is still continuing. At the beginning of the century, Europe was an almost entirely Christian continent. In the European population of 403 million in 1990, 381 million were Christians. Besides them, there were about 10 million Jews and 9 million Muslims. Muslims were mainly in Russia and Bulgaria of East Europe and in several countries of South Europe. Jews were also mainly in East Europe, particularly in Russia, Poland and Romania. The first great change that occurred in the religious demography of Europe during the twentieth century was the expulsion and decimation of Jews. They now form about a quarter percent of the population compared to 2.5 percent in 1900. The second great change was the turning away from religion of the Soviet Block countries—mostly in East and South Europe—under the influence of Marxism that came to prevail there. In 1970, more than 21 percent of the population of Europe had become either Agnostic or Atheist and their share in East Europe had reached 37 percent. Then towards the end of the twentieth century, with the dissolution of Soviet Union and resurgence of nationalism, there has been a sharp recovery of faith in that region. The irreligious now form less than 10 percent of the population of East Europe. However, while the previously Marxist States of Europe are coming back to their Christian faith, the advanced Capitalist States of West, North and South Europe have come under the sway of a rising wave of irreligion. More than 23 percent of the population of West Europe has now turned irreligious, that share is above 20 percent in North Europe. In general, commitment to the faith seems to persist among the Catholics and Orthodox Christians while it is waning among the Protestants. Share of Muslims in Europe has more than doubled from 2.3 percent in 1900 to 5.6 percent in 2010; much of the increase has happened after 1970. More significantly, the rise has been more pronounced outside East Europe, where Muslims had a significant presence in 1900. In East Europe, their share has increased from 4.35 to 5.69 percent between 1900 and 2010, with much of the increase happening in the last decade. In South Europe, on the other hand, their share has increased from 2.6 to 6.6 percent; in West Europe, from 0.05 to 6.1 percent; and, in North Europe from 0 to 2.9 percent. West Europe seems to have born the brunt of the rise of Muslims in Europe. In France, Muslims now form 8.6 percent of the population, and that share is rapidly rising. Other countries of West Europe and United Kingdom, Denmark and Sweden of North Europe are also experiencing considerable rise in the Muslim presence. Regions and countries most affected by the rise of irreligion are also the ones that are experiencing the rise of Muslims. Could there be a correlation in the two phenomena? countries. Sources of the data are as indicated in our earlier blog. In 1900, nearly 95 percent of the population of Europe was Christian. The share of Christians in 2010 is 78.6 percent, but this decline is because a considerable number of Europeans seem to have turned away from religion since the middle of the twentieth centuries. They have lost faith, but have not converted to a faith other than Christianity. They may not want to be counted as Christians, yet they remain faithful to the essentially Christian civilisation of the West. They would come back to Christian religion, when the intellectual fashion begins to change. As seen in the figures above, such reversion has already begun. Share of the Non-Religious or Agnostics and the Atheists in the population has come down from its peak of 21 percent in 1970 to less than 15 percent in 2010. This recovery of faith in Christianity is largely confined to East Europe, which had become the least religious, as we shall see below. West and North Europe, on the other hand, are becoming more irreligious. Muslims remain a small minority in Europe, though their share in Europe has increased from 2.3 percent in 1900 to 5.6 percent in 2010. Much of this increase has taken place after 1970. Increase in the number and share of Muslims is much higher in some specific regions and countries of Europe, as we shall discuss below. The decimation and expulsion of Jews from Europe in the earlier half of the twentieth century is among the most significant changes that have happened in the religious profile of that continent. At the beginning of the twentieth century, Jews formed nearly 2.5 percent of the population; their share declined to 0.65 percent in 1970 and has declined further to merely 0.26 percent in 2010. There were nearly 10 million Jews in Europe in 1900 and there are less than 2 million now. Among the 5.6 million ‘others’ in 2010, 1.2 million are Ethnic Religionists, nearly all of them in the Russian Federation; 1.5 million Hindus, Sikhs and Jains, of whom more than a million are in England alone; and, about 2 million Buddhists, Chinese Religionists and Confucianists, of whom about a million are in West Europe, mainly in France and Netherlands, and another more than half a million in Russia. 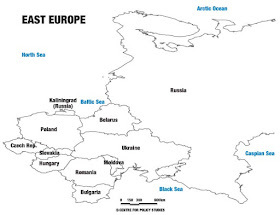 East Europe comprises the countries of the former Soviet Union and the former Soviet Block. These include: Russian Federation (Russia for short), Ukraine, Belarus, Poland, Romania, Czech Republic, Hungary and Bulgaria. The sketch map of East Europe here indicates the geographical positions of these countries. The population of East Europe has been contracting during the last two decades. This is partly a consequence of the breakdown of the Soviet Union and consequent dislocation of public and economic life in this region. In nearly all of the countries of East Europe, the total fertility rate (TFR) is far below the population replacement rate. East Europe saw a sharp decline in the share of Christianity in the earlier half of the twentieth century, with more than one third of the population turning Non-Religious or Atheist under the influence of the godless Marxist ideology and State. There has been an equally sharp revival of Christianity in recent decades. Share of the irreligious in the population of East Europe has declined from 37 percent in 1970 to less than 10 percent in 2010. The decline has been particularly rapid during the last decade, which is probably because of the commitment to nationalism and religion displayed by the current Russian leader Vladimir Putin and can probably be termed the ‘Putin Effect’. Christians now form 84 percent of the population of East Europe, much above 57 percent in 1970, but still somewhat below their share of nearly 90 percent at the beginning of the 20th century. Of 9.9 million Jews in Europe at the beginning of the twentieth century, 8.7 million were in East Europe, their number declined to 3 million in 1970 and has declined further to around half a million in 2010. In 1900, an overwhelming majority of the Jews in Europe were in East Europe; now most of them are in France, Germany and the United Kingdom. Muslim presence in East Europe has increased marginally from 4.35 percent in 1900 to 5.69 percent in 2010 and much of this rise has occurred during the last decade. Among 1.7 million ‘others’ in 2010, there are a million Ethnic Religionists and about 0.6 million Buddhists. Of a million ‘others’ in 1900, 0.6 million were Ethnic Religionists and 0.4 million Buddhists. The share of these two communities in the population of East Europe has remained largely unchanged in this whole period of eleven decades. A: Agnostics (non-Religious) and Atheists. Russian Federation, or Russia, is the largest country of East Europe in population; in area, it is the largest nation of the world. Nearly half of the population of East Europe is in Russia. The decline of faith that took place in Europe and many other parts of the world during the twentieth century was the most pronounced in Russia. In 1970, 51.5 percent of the population of this nation had turned irreligious. Share of the professed Christians was only 28.5 percent, the remaining 10 percent were hidden or Crypto-Christians. The recovery of faith noticed after 1970 has also been the most pronounced in Russia, especially during the last decade. Christians now form 81 percent of the population compared to 57 percent in 2000. A vast majority of the Christians are adherents of Eastern Orthodoxy. Muslims: Surprisingly, the share of Muslims also has grown sharply in this decade from 7.6 to 10.4 percent. This may be because of a similar revival of faith among them; more likely, it could be because of their relatively higher fertility in a period when others in the region are shrinking in numbers. Jews: In 1900, there were 4.5 million Jews forming 6 percent of the population; in 1970, their number was reduced to 2.2 million. In 2010, there are only 187 thousand Jews. Ethnic Religionists: Nearly all of the Ethnic Religionists in East Europe are in Russia. Their number in 2010 is about a million; there were about 600 thousand of them in 1900. T in ‘000, C: Christian, A: Agnostic/Atheist. Ukraine, Belarus and Moldavia were earlier part of the Soviet Union and are now independent countries. Like Russia, all of them went through a phase of the rise of irreligion and have begun to recover their Christian faith in the recent past. But, the sharp rise of the share of Christians seen in Russia during the last decade has not been experienced in Ukraine and Belarus; the share of the irreligious in both these countries, therefore, remains fairly high at 15 and 26 percent, respectively. Moldavia, on the other hand, has seen a deep reduction in number and share of the irreligious during the last decade, and share of Christians there has risen to nearly 96 percent. All these countries are going through an unmistakable process of the recovery of faith. Christians in all three countries are mainly adherents of Eastern Orthodoxy. There are hardly any Muslims in this region. It also may be noticed that, like in Russia, there has been a decline in the total population of all these countries during the last decade. Poland lies to the west of Belarus and Ukraine and Romania to the south of Ukraine and Moldavia. Poland and Romania were both parts of the Soviet Block. However, effect of the wave of irreligion that swept through the countries in the Soviet Union was not very strong here. In 1970, Christians formed 91 percent of the population of Poland and 83 percent of Romania, though significant numbers of them were Crypto-Christians then. Now both countries are more than 95 percent Christian. Christians of Poland are mostly Roman Catholics while those of Romania are mainly adherents of Eastern Orthodoxy. Jews: In 1900, there were more than 2 million Jews in Poland forming 9 percent and there were about a half million Jews in Romania forming 4.5 percent of the then population. The Jews of Poland were almost totally exterminated or exiled. Only 8 thousand of them were left in 1970; that number has now improved to about 10 thousand. The extermination was not as complete in Romania, which had about 100 thousand Jews in 1970; but their number there has now declined to 6.5 thousand. Muslims: There are only a few Muslims in Poland and Romania. In Poland, there has been a sudden rise in their number from 5 thousand in 2000 to 39 thousand in 2010. In Romania, there has been a decline from 282 to 90 thousand during the same decade. These three countries of the erstwhile Eastern Block lie between Poland and Romania. Revival of Christianity that is taking place in this region has not reached these three. Share of the irreligious in Slovakia and Hungary remains nearly unchanged since 1970. In the Czech Republic, their share has increased to above 44 percent from 19 percent in 1970. This makes it the least religious country in the world after Estonia. Jews: In 1900, Jews had a share 2.7 percent in the population of both the Czech Republic and Slovakia. In Hungary, their share was higher at nearly 6 percent. Now, there are only a few Jews left in the Czech Republic and in Slovakia. In Hungary, there has been a sudden rise in the number of Jews from 45 to 92 thousand during 2000-10; they now form nearly 1 percent of the population. Muslims: There are not many Muslims in the Czech Republic or in Slovakia. In Hungary, there was a recent rise in their numbers, which has been partly reversed during the last decade. They now form about a quarter percent of the population. Bulgaria lies to the south of Romania and north of Greece and Turkey. Like most other countries of the Soviet Block, Bulgaria has largely recovered from the lack of faith that prevailed in the region in the second half of the 20th century. Christians now form 83 percent of the population. There are also 13 percent Muslims. In 1900, share of Muslims was higher at 17 percent. Christians of Bulgaria are mostly adherents of Eastern Orthodoxy. The religious profile of East Europe and of most of the countries within it has undergone two major changes during the twentieth century: One, decimation and exodus of Jews who formed a considerable proportion of the population of particularly Poland, Russia and Romania. Two, large scale prevalence of irreligion in the early part of the twentieth century and widespread recovery of faith towards the end of the century. This process of recovery of faith is still continuing. Muslims in East Europe have a significant presence only in Russia and Bulgaria, where they form 10.4 and 13.1 percent of the population, respectively. In both these countries, their share has increased considerably during the last decade. It, however, remains below the level of 1900 in Bulgaria, while in Russia it is now slightly above that level. South Europe was 97 percent Christian in 1900. It had only 1.8 million Muslims, who were largely confined to the countries of Southeast Europe that formerly formed Yugoslavia. Of 174 thousand Agnostics and Atheists, more than a hundred thousand were in the former Yugoslavia. Of 145 thousand ‘others’ in the Table above, 144 thousand were Jews; of them, 95 thousand were in Greece and Italy. The main change in the religious profile of South Europe that has taken place during the twentieth century is an increase in the share of Muslims and in that of the Non-religious and Atheists. The former have grown from 2.6 to 6.6 percent of the population and the latter from nearly nil to around 11 percent. Because of the rise of Muslims and the irreligious, the share of Christians in South Europe at 82.5 percent now is slightly less than their share of 84 percent in East Europe. South Europe comprises Greece, Albania and former Yugoslavia in the Balkan Peninsula, Italy in the heart of the Mediterranean and Spain and Portugal in the Iberian Peninsula. These sub-regions have fairly different religious profile and have experienced different changes during the twentieth century, some of which we explore below. The map below indicates the geographic location of these countries in South Europe. These countries, lying between Bulgaria, Romania and Hungary on the east and the Adriatic Sea on the west, have a distinctly high Muslim presence compared to others in the region and in the rest of Europe. Serbia does not entirely belong to this group, but has been included because Serbia, Kosovo and Montenegro were together till recently. These countries have also seen a sharp decline in the prevalence of irreligion in the recent past. Albania has the second highest Muslim presence in Europe after Kosovo. Muslim share in the population is as high as 63 percent. Most of the remaining population is Christian. Religious profile of Albania was about the same in 1900 with Muslims forming two-thirds and Christians the remaining one-third of the population. In the middle of the 20th century, the country had an upsurge of irreligion. In 1970, 64 percent of Albanians were irreligious and there were nearly no Christians left. Albania at that time was considered the most irreligious country in the world. That phase has passed and most of the people have reverted to their Christian or Islamic faiths. There has been considerable decline in the share of the irreligious even during the last decade 2000-10. In this decade, the share of Christians has slightly declined, while that of Muslims has increased from 39 to 63 percent. This may portend of the future direction of religious change in Albania. Macedonia became an independent country following the first breakup of Yugoslavia in 1991. The population of Macedonia now is nearly 64 percent Christian and 33 percent Muslim. Unlike in Albania, such high level of Muslim presence in Macedonia is a recent phenomenon. Their share has risen to this level from only 8.4 percent in 1900 and 11 percent in 1970. Share of Christians has correspondingly declined from 90.6 percent in 1900 to 63.6 percent now. Irreligion did not become as widespread in Macedonia as in some other countries of this region. Only 7 percent of the population was in this category in 1970 and 8 percent in 2000; that share has declined to 3.6 percent now. Serbia, Kosovo and Montenegro formed the remaining Yugoslavia after the separation of Macedonia, Slovenia and Croatia in the early 1990s. During the last decade, Montenegro and Kosovo have separated from Serbia. The Table here gives data of the three countries together. Muslims form 24.7 percent of the population of these three; their share in 1900 was less than 10 percent. Share of Christians is correspondingly reduced from 89.3 percent in 1900 to about 72 percent now. There was an upsurge of Atheism and Agnosticism towards the middle of the century. In 1970, 29 percent of the population had become irreligious. That share has now declined to about 3 percent. Muslims form more than 93 percent of the population of Kosovo. Serbia, the largest of the former Yugoslavian states, is 89 percent Christian, Muslims from only 7 percent of the population. In Montenegro, Muslim presence is higher at 17.3 percent, while Christians dominate with a share of 77 percent. The dominance of Muslims in Kosovo has led to the final splitting of what was left of the federal state of Yugoslavia. Bosnia & Herzegovina is nearly equally divided between Christians and Muslims, with the former comprising 48.3 and the latter 47.5 percent of the population. In 1900, they formed 60 and 39.5 percent of the population, respectively. The share of Muslims had gone up to 60 percent in 2000 and has now reverted to 47.5 percent. This is probably because of the shifting of populations in the course of the wars and conflicts that have been continuing in this region in recent decades. The share of the irreligious had gone up to 14.4 percent in 1970; it has now declined to about 4 percent. Albania, Macedonia, Kosovo and Bosnia & Herzegovina have high presence of Muslims in their population; Muslims form 63 percent of the population in Albania, 33 percent in Macedonia, 93 percent in Kosovo and 47.5 percent in Bosnia & Herzegovina. In all of these, except Albania, their share has grown considerably during the 20th century. The rise is particularly remarkable in Macedonia and Serbia-Kosovo region, where Muslim presence was fairly low in 1990. Serbia and Montenegro have relatively lower Muslim presence at about 7 and 17 percent, respectively. All these countries, except Macedonia, saw a considerable upsurge of Agnosticism and Atheism in the middle of the century. The phenomenon was especially strong in Albania. That phase has abated. Decline in the share of the irreligious has been particularly rapid in the last decade. These two countries, located to the north and west of Bosnia & Herzegovina, were the first to separate from Yugoslavia in the early 1990s along with Macedonia. Unlike other countries of this region that we have discussed above, these two are almost entirely Christian and have only a few Muslims. Muslims form 1.9 percent of the population in Croatia and 2.4 percent in Slovenia. There were almost no Muslims in both these countries at the beginning of the twentieth century. In Slovenia, there were only about 1.4 thousand Muslims even in 2000; their number has increased to more than 49 thousand in 2010. In both countries, there has been an increase in the share of the irreligious. Most of the countries that comprised former Yugoslavia had experienced a widespread loss of faith in the earlier part of the twentieth century. That phenomenon was rather mild in Croatia and Slovenia; only 3 percent of the population of Croatia was Agnostic or Atheist in 1970 and the proportion was about 7 percent in Slovenia. In recent decades, all the other countries that had become strongly irreligious have experienced a rapid recovery of faith; in Croatia and Slovenia, on the other hand, the share of the irreligious has increased. We shall see that this is true of most of the remaining countries of Europe also. Greece lies to the south of former Yugoslavia between the Ionian and Aegean Seas. Unlike adjoining Albania, Macedonia and Bulgaria, Greece does not have many Muslims. But their share has risen from 1.48 percent in 1970 to 4.23 percent now. In 1900, Muslim presence was much higher at 12.8 percent. Like that of Muslims, share of the irreligious has also been rising since 1970; during 2000-10, it has increased from 1.88 to 3.55 percent. Christianity, therefore, has declined from 98.3 percent in 1970 to 91.8 percent now. Italy, in the middle of the Mediterranean, is the largest country of South Europe in population. Of 155 million people in the region in 2010, 61 million are in Italy. There are not many Muslims, but their share has been growing and it has increased from 1.18 to 2.45 percent in the last decade alone. Share of the irreligious is much higher than in Greece and has grown to 16.49 percent from almost nil in 1900 and 11.39 percent in 1970. The share of Christians in Italy has consequently declined from 99.7 percent in 1900 to 88.4 percent in 1970 and 80.8 percent now. Spain and Portugal lie to the west of Italy between the Mediterranean on the east and the Atlantic on the west. Muslim North Africa is just across the narrow strait of Gibraltar. But there are not many Muslims in Spain or Portugal. They have a share of 0.40 percent in Portugal and 2.32 percent in Spain. In the latter, there has been a remarkable increase in the Muslim share during the last decade, though it has been slowly rising in Portugal also. Both countries are also witnessing a considerable rise in Agnosticism and Atheism. Share of the irreligious in Spain has gone up from 2.21 percent in 1970 to 9.08 percent in 2010 and from 2.27 to 7.34 percent in Portugal. Share of Christians has therefore declined from nearly 100 percent at the beginning of the 20th century in both countries to 88.36 percent in Spain and 91.35 percent in Portugal. Smaller countries: Besides the above, there are several small countries in the region including Malta off the southern end of Italy in the Mediterranean, Andorra on the borders of Italy and Spain, Gibraltar in the Gibraltar Strait and the enclave states of San Marino and the Vatican City or the Holy See within Italy. All these microstates are essentially Christian, except for the presence of about 5 percent Muslims in Gibraltar and of 5 to 10 percent Agnostics and Atheists in all of them except the Holy See which, of course, remains 100 percent Christian. Like much of Europe, West Europe was almost fully Christian at the beginning of the twentieth century. Christians then formed nearly 99 percent of the population. Of the remaining, there were Jews, who formed 0.8 percent of the population, and a few of the irreligious, who formed about 0.4 percent. In the course of the twentieth century, share of Muslims in West Europe has grown from nearly zero to above 6 percent, and their number has risen from around 51 thousand to 11.6 million. Much of this increase in the share and number of Muslims has happened in the later part of the twentieth century; even in 1970, there were only 2 million Muslims in this region forming 1.20 percent of the population. The number and share of Agnostics and Atheists in the region has been rising throughout the century. And unlike in East and parts of South Europe, where this phenomenon has been largely reversed with the decline of the Marxist-Leninist States, the lure of irreligion continues to be strong in the advanced Capitalist States of West and North Europe. The irreligious now form 23.4 percent of the population of West Europe compared to 9.5 percent in 1970 and less than half a percent in 1900. The share of Christians, therefore, has declined to about 69 percent from nearly 99 percent in 1900 and 89 percent in 1970. Of 1.8 million listed as ‘Others’ in the Table above, more than a million are Buddhists and Chinese Religionists, about 440 thousand followers of Ethnic Religions and various New Religions and about 330 thousand Hindus, Sikhs and Jains. 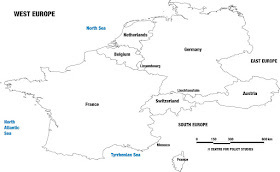 West Europe comprises six major countries: Switzerland, Austria, France, Germany, Belgium and Netherlands. Besides these, there are several smaller enclaves and islands. 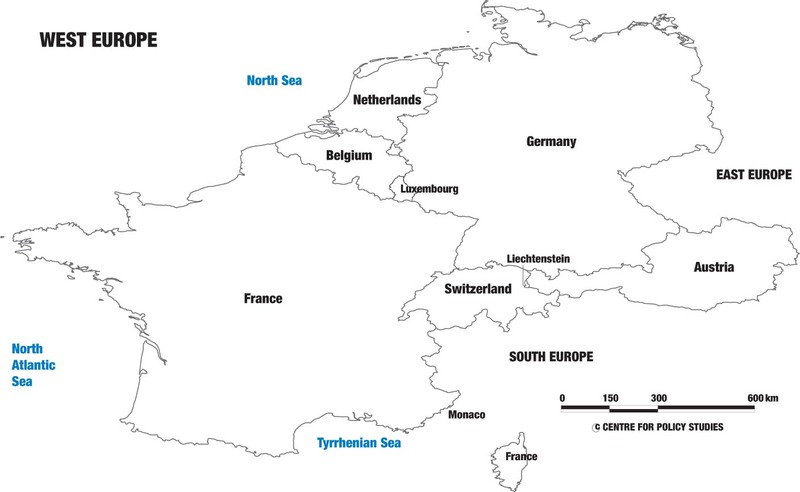 Geographic position of these countries within West Europe is indicated in the map here. The trends of change in the religious demography that we have noticed in West Europe are replicated in all the six major countries of this region. All six of the major countries of West Europe were nearly fully Christian in 1900 and had few Muslims. There were also few Atheists or Agnostics, except in the northern countries of Belgium and Netherlands, where they had a non-negligible share of around 1 and 1.5 percent, respectively. Austria, Netherlands and Germany had a significant number of Jews; their share in these three countries was 2.76, 2.04 and 1.14 percent, respectively. In all the six countries, share of Muslims has grown rapidly after 1970. Now they form between 4.5 to 8.5 percent of the population everywhere. Their highest presence is in France, where Muslims now number 5.4 million and have a share of 8.55 percent in the population. In 1970, France was the only country of the region to have a significant Muslim presence of 2.66 percent; in the other five countries, their share then was below 1 percent. In Switzerland, Austria, Belgium and Netherlands there has been a sudden spurt in the number and share of Muslims during the last decade of 2000-10. Share of the Agnostics and Atheists has been rising in all these countries, but there has been a remarkable spurt in it during the last decade, especially in Belgium, Netherlands and Austria. In the East European countries, on the other hand, there has been an equally remarkable decline in the share of Agnostics and Atheists in this decade. Unlike in other parts of Europe, there was only a slight decline in the number of Jews in West Europe between 1900 and 1970. But as seen in the Table here, there was a large-scale shifting of Jews to France and Belgium from the other four countries. In 1900, of 863 thousand Jews in West Europe, 480 thousand were in Germany and another 272 thousand in Austria and Netherlands. In 1970, of 685 thousand Jews in West Europe, 550 thousand were in France and another 40 thousand in Belgium. In Germany, their number had declined from 480 thousand to merely 33 thousand. In recent decades, there has been some rise in their numbers in both Germany and France. Besides the six major countries that we have discussed above, West Europe includes the independent municipality of Lichtenstein within Germany, the enclave state of Monaco on the Mediterranean coast off mainland France and Luxembourg lying between France, Belgium and Germany. Of these only Luxembourg has a significant population of 507 thousand in 2010. There has been a rise in the Muslim share in Lichtenstein from 2.7 percent in 2000 to 6.4 percent in 2010, but their numbers have remained small, rising from 879 to 2,300 in this decade. 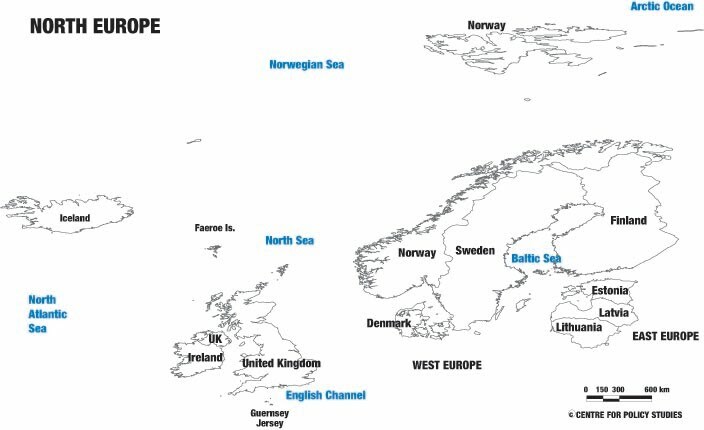 North Europe comprises Ireland, United Kingdom of England, Denmark, Sweden, Norway, Finland, Estonia, Latvia and Lithuania. As seen in the Map below, these countries fall into several separate units separated by the seas. Three of the eastern countries of North Europe—Estonia, Latvia and Lithuania—were part of the Soviet Union and have a different religious demographic history than others. While discussing religious profile of individual countries in the subsequent sections, we shall take up these three separately from others. Like most of Europe, North Europe was almost fully Christian in 1900. Christians formed more than 98 percent of the population then. There were also 1.4 percent Agnostics and Atheists. These two categories exhausted nearly the whole population. Besides them, there were less than a thousand Muslims and 264 thousand Jews. That left only 10 thousand ‘others’ in the whole of North Europe. In the course of the twentieth century, share of Muslims in North Europe has indeed increased, but the rise has been moderate compared to other parts of Europe. Even so, the number of Muslims has more than doubled between 1990 and 2010 and they now have a share of around 2.9 percent of the population. Like West Europe, North Europe is experiencing a spurt in the prevalence of irreligion. In 1990, 1.40 percent of the population was irreligious. That share went up to 11.25 percent in 1970 and his risen to 20.15 percent. Much of this rise, as in West Europe, has taken place in the last decade alone. Because of the relatively lower share of both Muslims and Agnostics or Atheists, the share of Christians in North Europe at around 75 percent is higher than in West Europe where they now form less than 69 percent of the population. United Kingdom is the largest country of North Europe accounting for 63 percent of the population of the whole region. Sweden, though much smaller in population, is the second largest. These two countries have the highest share of the Agnostics and Atheists among these six. In Sweden, that share was nearly 25 percent already in 1970; the irreligious now form nearly one-third of the population. In the United Kingdom, share of the irreligious has risen suddenly from 13 to 21 percent in the last decade. Muslims form 3.36 and 3.62 percent of the population of United Kingdom and Sweden, respectively. This is the highest in North Europe after Denmark. In Sweden, there were not many Muslims even in 1970 when they formed only 0.03 percent of the population. In UK, their share in 1970 was somewhat higher at 1.14 percent. Both these countries have experienced a substantial rise in the Muslim share in recent decades. Because of the high presence of the irreligious and relatively higher presence of Muslims, share of Christians in UK and Sweden now is the lowest in North Europe. Christians form 72.6 percent of the population in the United Kingdom and 63.6 percent of Sweden. Adherents of religions other than Christianity and Islam have a share of nearly 3 percent in the United Kingdom now. Most of such adherents in North Europe are in UK. Of 335 thousand Jews in the region in 2010, 291 thousand are in UK where they form nearly half a percent of the population. Of 692 thousand Hindus, 662 thousand are here and they now form more than 1 percent of the population of UK. Of 414 thousand Sikhs in the region, 412 thousand are in UK; they form about 0.7 percent of the population, which is much higher than in many provinces of India. Of about 300 thousand Buddhists, 197 thousand are here, but they have a significant presence in Norway and Sweden also. Of 81 thousand Chinese Religionists, 62 thousand are in UK; but they have some presence in several other countries of the region also. As seen in the Table here, there has been a considerable rise in the share of all these religions in recent decades; however, the share of Jews in UK has considerably declined since 1970. Share of Muslims in Norway is lower at around 3 percent. But in 1990, there were only 1 percent Muslims here and nearly none in 1970. Irreligion is also relatively less prevalent in Norway. In 2010, only about 6 percent of the population is irreligious; this ratio was 2.5 percent in 2000 and 1 percent in 1970. Because of this somewhat lower share of Muslims and the irreligious, Christians still form nearly 90 percent of the population. Muslims form 4 percent of the population of Denmark now; this represents the highest share of Muslims in North Europe. Much of the rise in Muslim presence has occurred in the last decade. There were only 1.26 percent Muslims in 2000 and 0.24 percent in 1970. Share of the irreligious in Norway has also increased from less than 7 percent to 11.4 percent during the last decade. Their share was less than 3 percent in 1970. But the prevalence of irreligion in Denmark is still much lower than in UK and Sweden. Share of Christians, therefore, is still relatively high at around 84 percent. There are only a few Muslims in Finland, but their share has increased from 0.18 to 0.45 percent in the course of the last decade. Share of the Agnostics and Atheists, however, has risen from 6.84 to 18.43 percent in this decade. Share of Christians, therefore, has declined from 93 to 81 percent. In 1900, Finland was 100 percent Christian. The wave of irreligion flowing through West, North and parts of South Europe has not affected Ireland too strongly. Only 4.79 percent of the population has come under its sway. This ratio is much higher than 2.54 percent in 2000 and 0.25 percent in 1970. But it is far below the share of the irreligious in other countries of the region, except Norway where their share is only slightly higher at 6.25 percent. There are also not many Muslims in Ireland; they form only 0.69 percent of the population in 2010. Christians, therefore, have a share of more than 94 percent in the population. This is lower than the Christian share of above 99 percent in 1900 and even in 1970. But it still makes Ireland the most Christian country of North Europe. Incidentally, unlike other countries of this region, Ireland is a Catholic country. These three countries share borders with Russia and Belarus and were part of the Soviet Union. Like other Soviet countries, Estonia and Latvia had become largely irreligious in the middle of the twentieth century. In 1970, 53.4 percent of the population of Estonia and 47.6 percent of Latvia had turned Agnostic or Atheist. Lithuania had not turned away from religion as strongly as Estonia and Latvia, but 29 percent of the population of that country had also become irreligious in 1970. Since then, Lithuania has experienced a strong recovery of faith like many countries of East Europe. The recovery is less robust in Latvia. Estonia, however, has become even more irreligious during the last decade after a weak recovery in the earlier two decades. Estonia is now the least religious country of the world. Historically, Estonia has been a protestant country, while Lithuania is largely Catholic. Latvia has been divided between Protestants, Catholics and Orthodox Christians. Is the persistence or otherwise of irreligion in these countries somehow related to these differences in their denominations? 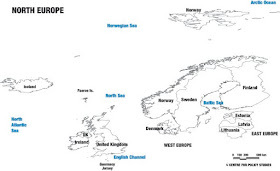 Besides the countries discussed above, there are several smaller and often remote countries in North Europe. These include: Isle of Man between Ireland and United Kingdom, Channel Island off France in the English Channel, Faroe Islands far in the north in the Atlantic Ocean, Iceland further north of Faroe Islands. All these countries are largely Christian, but share of the irreligious has now reached near 15 percent in Channel Island and in the Isle of Man. 1. Europe is a Christian continent. At the beginning of the twentieth century nearly 95 percent of the population was Christian. Of the rest, about 2.5 percent were Jews and 2.3 percent Muslims. And, most of the Jews and Muslims were in East Europe. 2. The share of Christians has now declined to 78.6 percent. Their share is even lower in West and North Europe. 3. This decline in Christianity has been largely due to the rise of irreligion in Europe. In 2010, 14.8 percent of the population of Europe adhered to no faith. The proportion of the irreligious was even higher in West and North Europe. 4. Jews were largely expelled or eliminated from Europe in the earlier half of the twentieth century. They now form about a quarter percent of the population compared to 2.5 percent in 1900. 5. Share of Muslims in Europe has nearly doubled from around 2.3 percent in 1900 to 5.6 percent in 2010. Much of this change has happened in recent decades. Rise of Muslims, like that of the irreligious, is also more pronounced in West and North Europe. 6. East Europe, which had come under the sway of the godless Marxism, is now the most Christian region of Europe. Christians form 84 percent of the population here in 2010. 7. This is because East Europe has largely recovered from the irreligion that came to prevail here in the middle of the twentieth century. Share of the irreligious in East Europe had reached 37 percent in 1970; it has declined to less than 10 percent now. A major part of the decline has happened during the last decade. 8. This recovery of faith in East Europe is perhaps the most significant religious change happening in the world of today. The phenomenon is the most pronounced in Russia and seems to be largely driven by the nationalist and religious commitments of the current leadership of Russia. Therefore, it may not be misplaced to call the recent rise of Christianity in East Europe as the ‘Putin Effect’. 9. There has been a slight increase in the share of Muslims in East Europe. They now have a share of 5.7 percent compared to 4.4 percent in 2000 and about the same in 1900. This may partly imply recovery of Islamic faith among the Muslims who had turned irreligious, but is more likely to be the effect of higher Muslim fertility in a region where total populations are shrinking. 10. Within East Europe, Moldavia, Poland and Romania have now become almost fully Christian. The irreligious continue to have a relatively high share of between 10 to 15 percent in Ukraine, Slovakia and Hungary. In Belarus and Czech Republic, their share is as high as 26 and 44 percent, respectively. In Russia and Bulgaria, Muslims have a considerable share of above 10 percent, but share of the irreligious is now low. 11. Share of both the irreligious and Muslims in South Europe now is somewhat higher than in East Europe. Therefore, the share of Christians is a little lower at 83 percent. The region, however, was 97 percent Christian in 1900. 12. South Europe has two distinct components. There are the countries of former Yugoslavia, which were earlier in the Soviet Block. And, there are Albania, Greece, Italy, Spain and Portugal of the western block. 13. Albania is now 63 percent Muslim and 32 percent Christian. In 1970, 64 percent of the population had turned irreligious. 14. Of the countries of former Yugoslavia, Kosovo is now nearly fully Muslim. Montenegro and Bosnia & Herzegovina also have considerable Muslim presence. Serbia, Croatia and Slovenia are now largely Christian. 15. But the irreligious do not have much presence in any of the countries of former Yugoslavia, except Slovenia, which has seen some rise in their share in recent past. 16. Contrary to the experience of East Europe and of the Yugoslavian part of South Europe, Greece, Italy, Spain and Portugal are seeing a spurt in the share of Agnostics and Atheists in recent decades. 17. Share of the irreligious is still low in Greece. And, share of Muslims also remains low in spite of a slow rise in recent decades after a sharp fall from nearly 13 percent in 1900 to 1.5 percent in 1970. Christians now form 92 percent of the population of Greece. 18. The irreligious, however, now form 16.5 percent of the population in Italy and have a share of 9 percent in Spain and above 7 percent in Portugal. In Italy and Spain, the share of Muslims also has risen to above 2 percent in recent decades. These three countries were nearly 100 percent Christian in 1900. Share of Christians now is around 81 percent in Italy, 88 percent in Spain and 91 percent in Portugal. 19. While East Europe and much of South Europe have undergone a strong recovery of faith in recent decades, West Europe seems to be in the grip of a new way of irreligion. Share of the irreligious in West Europe has risen from 0.38 percent in 1900 to 9.5 percent in 1970, 17.3 percent in 2000 and 23.4 percent in 2010. 20. Muslim presence has also been rising in West Europe. There were almost no Muslims here in 1900; their share went up to 1.2 percent in 1970, 5 percent in 2000 and 6 percent in 2010. 21. Because of the rise of the irreligious and the Muslims, share of Christians in West Europe has now reached below 69 percent from nearly 99 percent in 1900. It has now become the least Christian part of Europe. 22. Within West Europe, share of Muslims is the highest in France. Of 11.6 million Muslims in the region, 5.4 million are in France and they form 8.6 percent of the population of the country. Their share was 0.12 percent in 1900, 2.7 percent in 1970 and 7.1 percent in 2000. 23. Share of Muslims has increased in Austria, Switzerland, Germany, Belgium and Netherlands also during recent decades. Share of the irreligious has also increased everywhere in this region. Therefore, Christians now form less than 70 percent of the population in France and Netherlands, around 70 percent in Germany and Belgium and around 78 percent in Austria. Only in Switzerland, their share is still above 80 percent. 24. The wave of irreligion that is sweeping through West Europe has brought most of North Europe also in its sway. Now more than 20 percent of the population of this region is irreligious. 25. Share of Muslims has also been rising, but it remains far below West Europe. Muslims form 2.89 percent of the population of North Europe in 2010. 26. Within North Europe, United Kingdom, Sweden and Finland have come under the grip of irreligion most strongly. The irreligious form 32 percent of the population of Sweden, 21 percent of UK and 18 percent of Finland. 27. Share of Muslims is the highest in Denmark at 4 percent and it is near or above 3 percent in Sweden, UK and Norway. 28. Ireland has remained largely steady in its Christian faith and has nearly no Muslims. Therefore, share of Christians in Ireland remains high at 94 percent. Their share is near 90 percent in Norway also, where only 6 percent of the population is irreligious. 29. 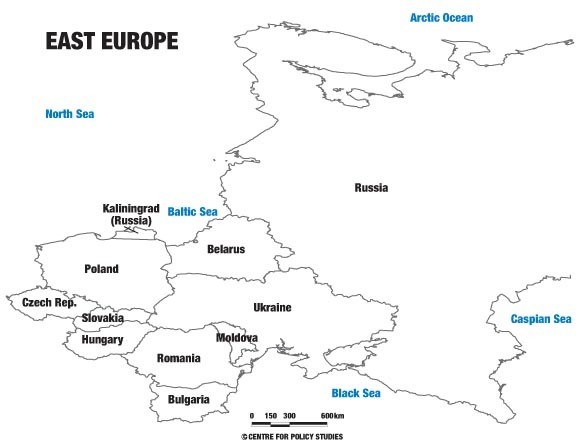 Three of the formerly Soviet countries—Estonia, Latvia and Lithuania—are in North Europe. Agnosticism and Atheism remain strong in Estonia and Latvia. Lithuania, like much of East Europe, has experienced a recovery of faith and is now 89 percent Christian. 30. Religious demography of Europe during the twentieth century was marked by a rise of irreligion in East and parts of South Europe in the middle of the twentieth century. That phase seems to have passed, and those parts of Europe have experienced a strong recovery of faith. 31. But while East Europe and much of South Europe have reverted to their faith, parts of South Europe, and almost all of West and North Europe are undergoing a new wave of irreligion in the recent past. This has put Christianity under pressure in these parts. 32. Most of the Muslims in Europe were in East and parts of South Europe. But in recent decade, Muslims have expanded into West and North Europe. The greatest expansion of Muslims has taken place in West Europe, particularly in France. 33. Most of the Jews in Europe were also in East Europe. Now there are few Jews left in Europe. 34. East Europe, which was the least Christian, has now become the most Christian part of Europe, while West and North Europe, which were nearly wholly Christian earlier are seeing a rise of both irreligion and Islam. We shall soon be posting Maps graphically showing the shift of Muslims and the Atheists or Agnostics from East to West and North Europe in the course of the twentieth century. 35. In general, it seems that the Catholic and Orthodox Christians have kept or recovered their faith while Protestants are turning towards Agnosticism and Atheism. Postscript: We shall soon post religious demographic maps of Europe that graphically show the rise of irreligion in East Europe in the earlier part of the twentieth century and the shift of the phenomenon to West and North Europe towards the end of the century. We shall also post maps showing the shifting of the Muslim presence towards the West.